By Alan Green in Uncategorized, VectorVest on 19th September 2017 . UK based Morses Club (MCL.L) is a home collected credit (HCC) lender. A consumer finance business focused on the UK home collected credit market, MCL operates under the Morses Club brand and provides unsecured loans to customers over 20-78 week periods, which are repayable on a weekly basis. It provides a range of loan products through a combination of traditional and online marketing channels. On August 31 2017, MCL said trading for the 26-week period to 26 August 2017 continued to be strong. Total credit issued increased by 25% to £82.2m compared to the same period last year (H1 2017: 16% to £66.0m), reflecting the significant increase in territory builds. Customer numbers increased substantially by 12% to approximately 233k, with the gross loan book also 12% higher (H1 2017: flat) and average customer balance unchanged. Territory builds are performing ahead of management’s expectations set at the beginning of the year, and overall business performance is in line with expectations. CEO Paul Smith said the board “are delighted with all aspects of the progress of the business, reflecting the fact that we have capitalised on market conditions, whilst developing our strategy of product diversification.” MCL interim results and dividend for the period will be announced on Thursday, 5 October 2017. MCL appeared across key VectorVest metrics in June when the shares traded around 122p. The stock triggered a series of system alerts again in the run up to the trading statement in August, before rocketing from 106p to 150p in a matter of weeks. Now at 143p, the stock still carries a reasonable RS (Relative Safety) rating of just 0.94 – fair on a scale of 0.00 to 2.00, but this only tells part of the story. The RT (Relative Timing) indicator, which is a fast, smart, accurate indicator of a stock’s price trend, shows a rating of 1.47 for MCL, which is excellent on a scale of 0.00 to 2.00. With the VST-Vector (VST) master indicator, (ranks every stock in the VectorVest database), also logging a ‘very good’ rating of 1.27 on a scale of 0.00 to 2.00, MCL remains undervalued against the current VectorVest valuation of 184p. 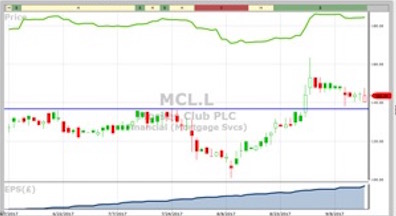 The chart of MCL.L is shown above in my normal notation. As discussed the share is much undervalued and growing EPS strongly. After a strong run the share has consolidated in a pattern which technical analysts refer to a “flag”. This is a bullish pattern and the probabilities favour a resumption of the trend soon. The pullback would seem to have run its course as the market has retreated to where old resistance has become potential suppport. The share is on a Buy recommendation on VectorVest. Summary: The plethora of credit solutions in the domestic market has witnessed plenty of notable success stories in recent years. MCL is another of these success stories, and following the bullish trading statement outlined here, there is every reason to expect the stock to continue delivering growth in customers, revenues, profits and dividends. With the VectorVest stock analysis and portfolio management system alerting members to the opportunity in June, and now with an increased valuation of 184p, we believe MCL offers an enticing investment opportunity in the run up to interim results early next month. Buy. Readers can examine trading opportunities on MCL and a host of other similar stocks for a single payment of £5.95. This gives access to the VectorVest Risk Free 5-week trial, where members enjoy unlimited access to VectorVest UK & U.S., plus VectorVest University for on-demand strategies and training. Link here to view.